Fred Mogubgub is primarily known for his television advertising work, but he also made underground short films that combined animation, illustration and live action, such as The Pop Show (1966). Mogubgub’s name does not appear in most — if any — texts discussing avant-garde and experimental film made in the late ’60s and early ’70s, even though the Underground Film Journal has found that his work was included in “underground” screenings in 1970. 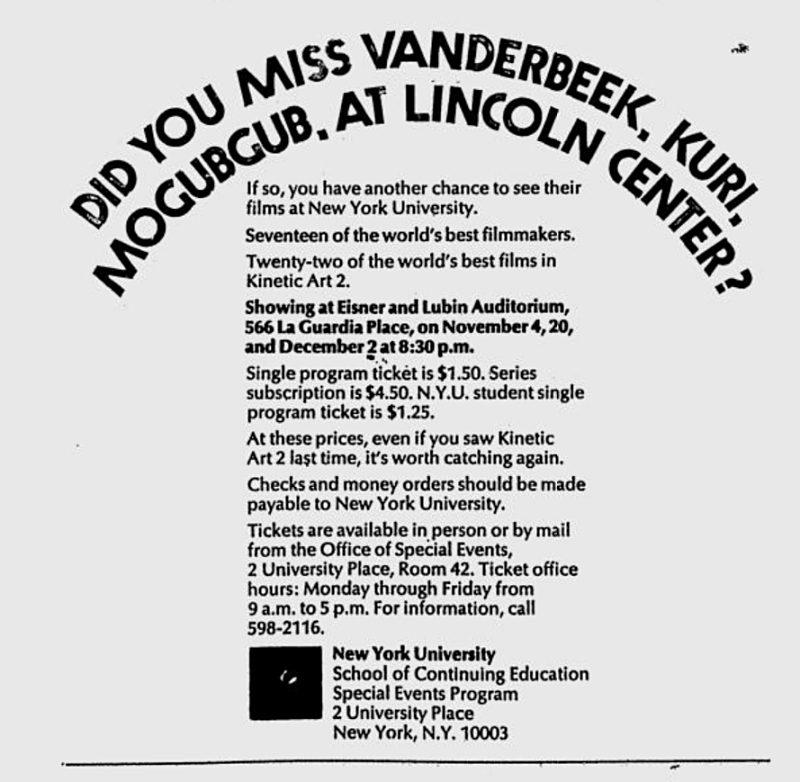 A night of Mogubgub’s films was included in the 1970 New York Underground Film Festival that screened at Max’s Kansas City on October 12-19. Mogubgub’s films screened on the 14th and it’s fairly likely that The Pop Show was included in the event, but cannot be verified. Mogubgub passed away in 1989. 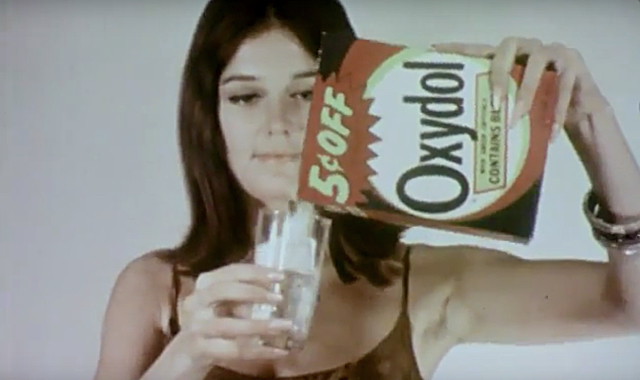 Most notable about The Pop Show is the appearance of Gloria Steinem, who appears in the film uncredited. 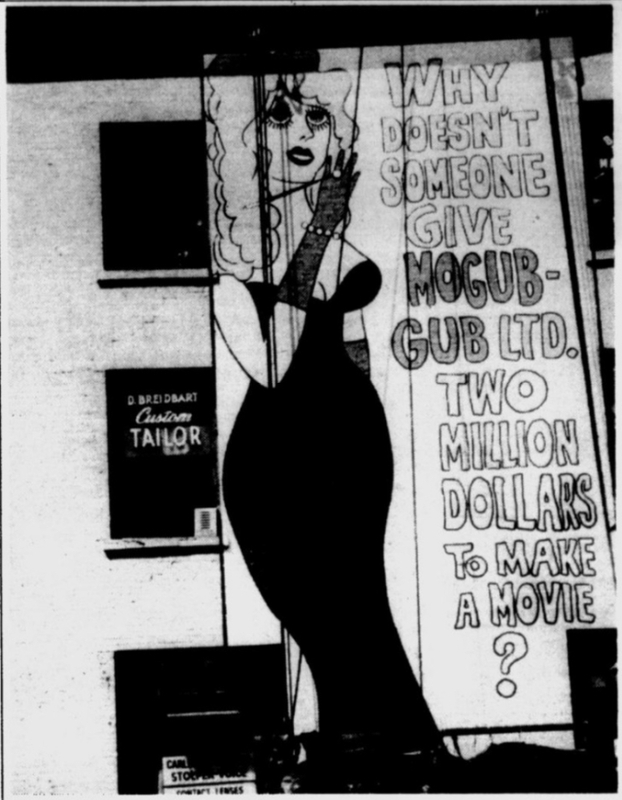 Mogubgub is possibly most famous for a mural he put up in Manhattan in 1965 that features a drawing of a wealthy woman in an evening gown accompanied by the text “Why doesn’t someone give Mogubgub Ltd. two million dollars to make a movie?” Mogubgub Ltd. was the name of his television advertising company. A photo of the mural was used in several March issues of the Village Voice in 1970 to promote The Kinetic Art 2, a three-night program of short films organized by the Universal Education and Visual Arts division of Universal Studios. The Kinetic Art 2 did not screen The Pop Show, but did screen Mogubgub’s Unknown Reasons, as well as films by Stan Vanderbeek, Jan Svankmajer, Jordan Belson, and others. The event took place at the Philharmonic Hall at Lincoln Center in New York City. The films then screened again in November and December at New York University. A gallery of these Village Voice ads is below.